This is WAY off the track when it comes to health – but I just had to comment! 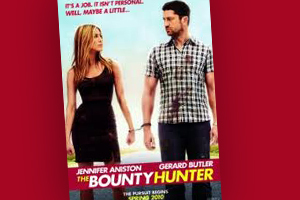 Last night I watched the Jennifer Aniston RomCom movie Bounty Hunter. Even though I prefer movies with some depth and meaning, I still don’t mind throwing on the old RomCom for a bit of “switch off” time and light entertainment. Which is what this was. Very light. My tagline – “healing is a journey, not just a raw food diet” means that when I define health, I look for definitions on all levels – physical, emotional, spiritual, financial, relationships, environmental etc. More often than not I get disturbed with the messages in the mainstream media that are damaging to many aspects of our health. And this movie proved to be no different. I know it wasn’t meant to be a deep and meaningful exploration of relationship full of insights and personal growth, ha ha ha ha ha, but one theme I picked up was a message I find to be quite harmful. The lead character – Jennifer Aniston – appears to be an accomplished, talented, and successful writer who had a relationship with a man (Gerard Butler) which ended, and now a couple of years later, they are thrust together due to circumstance. He has never gotten over her, and by the end of the movie we are supposed to (I think!) be cheering for them to get back together. Except this man has not one redeeming feature which would make a successful, talented woman want to be with him. He is rude, violent, patronising, insulting, abusive, poorly groomed, has a drinking problem, a gambling problem, horrible manners, (talks with his mouth full – a lot), is domineering, overbearing, cannot manage his money or his career – and we are supposed to think he’s a great catch???? What sort of message is this sending to young girls? “Let’s be thankful this sorry excuse for a man likes us, so we’ll be flattered and fall at his feet?”. What are we teaching impressionable girls about relationships when we see what is quite obviously a very dysfunctional man, being portrayed as someone our accomplished, gorgeous and successful leading lady wants to be with? Yes, I know we shouldn’t be learning about relationships from movies!! But it’s just a theme that I noticed and was disturbed by. Perhaps I’m overly sensitive on this issue – but far out, can’t we even have a leading man who we aspire to be with? Has anyone else seen this movie and thought the same thing? Have you noticed any other mainstream movies with unhealthy themes that really bothered you?